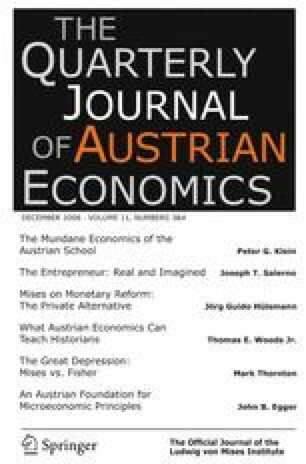 Ludwig von Mises established the foundations of modern Austrian economics while Irving Fisher established the foundations of modern mainstream macroeconomics and central bank policy. Fisher helped create and was a proponent of mathematical economics, statistics and index numbers, and a monetary policy that “stabilized” the value of the dollar. Fisher claimed that his scientific approach established a new era of prosperity during the 1920s. Mises published a book in 1928 that critiqued Fisher’s approach and predicted that it would lead to an economic crisis and collapse. Before the stock market crash in 1929 Fisher proclaimed a perpetual prosperity for the economy and continued to recommend investing in stocks long after the market had collapsed. In this important case study, Mises passed the “market test” while Fisher lost his personal fortune during an economic crisis that his economics help create. Mark Thornton (mthornton@prodigy.net) is Senior Fellow at the Ludwig von Mises Institute. I would like to thank Stephen Carson and Paul Wicks for useful comments and suggestions. Hoover, Kevin D. 2006. “Microfoundations and the Ontology of Macroeconomics.” (September 24). Available at SSRN: http://ssrn.com/abstract=932945. Thornton, Mark. 2004a. “Uncomfortable Parallels.” www.LewRockwell.com. April 18. Thornton, Mark. 2004b. “The ‘New Economists’ and the Great Depression of the 1970s.” Mises Daily Article. www.Mises.org. May, 7. Thornton, Mark. 2004c. “The Japanese Bubble Economy.” www.LewRockwell.com. May 23. Thornton, Mark. 2004d. “Housing: Too Good to be True.” Mises Daily Article. www.Mises.org, June 4.